Parshas Yisro–Do You Listen to What You Hear? Incredibly, the portion is entitled “Yitro” rather than “Moses” or “The Ten Commandments”. The reason for this begs an answer. The parsha opens with the simple, but piercing words, “Vayishma Yithro – Yithro heard”. The voice of G-d was audible throughout the universe, but it was only Yithro who heard. It was only Yithro who chose to abandon his prestigious position as a priest of Middian to join the Israelite in the desert. Our sages teach that when the kings of the nations heard the awesome sounds they thought that the world was coming to an end, and so, for a very brief moment, they stopped to listen. But when they realized that what they heard was the voice of G-d calling, they returned to their complacency. We find this pattern repeated in every generation. In a moment of threatening doom, people stop to listen, but as soon as the danger abates, it`s back to business as usual. Yithro was different. He not only listened, but he absorbed the teaching, took it to heart, and changed his life. Now we can better appreciate why the parsha of the giving of the Torah opens with those monumental words: “Vayishma Yithro”–”Yithro heard.” Before HaShem proclaims His commandments, the art of listening must be mastered. Whether a man succeeds in fulfilling his mission in life will depend upon his ability to attune his ears to the voice of G-d that is constantly calling. The greatness of Yithro was further evidenced when upon arrival at the desert encampment, he is told about the wondrous events that befell the Jewish people. The Torah relates: “Vayichad Yithro”–”Yithro rejoiced.” Our sages explain that the word “vayichad” is an expression of joy tempered by reservation, for even as Yithro heard the amazing events, he also felt a pang of sadness for his former friends, the Egyptians. And yet he declared “Baruch HaShem”–”Blessed be G-d who saved you from the hands of the Egyptians (Exodus 18:9-10). Our sages teach that Yithro is credited with proclaiming those two majestic words, Baruch HaShem, that have become the hallmark of our people throughout the centuries: “Baruch HaShem”–”Blessed be G-d” has been our response to all the challenges of life — to the joys as well as to the trials. At first glance, it may be difficult to comprehend why this phrase, Baruch HaShem, should be attributed to Yithro. Surely there were others who blessed G-d before him. After all, did not Moses praise G-d at the crossing of the Red Sea when he composed his glorious song? There is one fine difference however. Moses praised G-d for the miracles that befell his own people, but Yithro thanked G-d for the blessings that befall others. This concept of being happy for someone else is a goal for which we must strive. When we realize that we can find our own joy in the happiness that is visited upon others, we become elevated spiritual beings. To be sure, this is a difficult concept to accept in our culture which has conditioned us to measure our happiness by that which we acquire for ourselves rather than by that which we give to others. Therefore, we must bear in mind that G-d did not command us to become rich and successful, but He did command us to become giving, generous people, bestowing loving kindness, and to full heartedly proclaim “Baruch HaShem” when we behold the happiness of others. Every word, every aspect of the Ten Commandments is laden with profound meaning — even the structure speaks. For example, the first commandment, “I am the L-rd thy G-d” is parallel to the sixth–”Thou shalt not kill”, teaching us that when you kill someone, you don`t only kill that person, but you also kill a spark of G-d, for every man was created in His image. In this same way, there is a direct correlation between the placement of all the commandments on the Tablets. The Ten Commandments are the bedrock of our faith, and therefore, when they are read in the synagogue, it is a tradition for the entire congregation to rise during their recitation. Interestingly enough, the parsha in which this sacred gift is bestowed upon our people is called Yithro in honor of the father-in-law of Moses, who was a convert to Judaism. 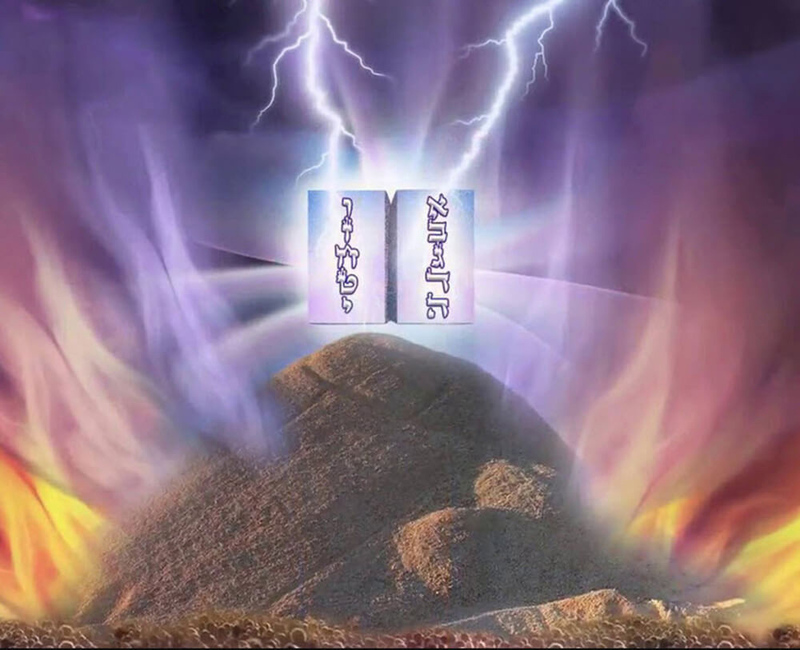 One would have imagined that it would have been more appropriate to dedicate the parsha in Moses` name or in honor of the Ten Commandments, but obviously there was something special about Yithro that merited this incredible privilege.